And probably a few other bits I've missed... All in all, a setup to rival Pink Floyd's on the rear sleeve of Ummagumma, if not to knock it into the proverbial cocked hat. So what do they do with all this stuff? 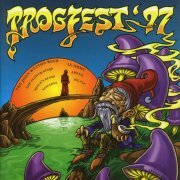 Go straight back to the early '70s, of course; apart from the production, this could've been recorded in 1973. What's more, they're pretty good at it, too; heavy Hammond-driven stuff, nothing over six minutes, Mellotron on pretty much every track (mostly strings). Definitely one for retro hounds everywhere, but genuinely good songs, within the fairly restrictive guidelines they've set themselves. To really confuse the issue, Closer to Doom was released in two versions. The original 1996 six-track CD EP has been succeeded by the following year's ten-track full-length album (still only 38 minutes). Try to find the later version, as the bonus tracks are worth a listen, although as a mixture of covers and live stuff they give the overall disc a slightly disjointed feel. No matter, as at least they bring it up to (vaguely) full-LP length. Three years on, their second album, Money Machine, is similar enough to their debut that if you liked one, you'll like the other, as their style hasn't noticeably changed in the interim. Hard to pick out particular highlights, as it's all pretty good (Neuropsychopathic Eye stands out, mind), but there's an absolute shedload of 'Tron all over the album; mostly strings and choir, but the odd bit of flute and brass (particularly on closer The Bitter End), too, and was that 'Tron vibes I heard at one point? An absolute must for 'Tron fanatics, anyway. 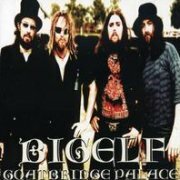 The band followed-up with the Goatbridge Palace EP, featuring Side Effects and (Another) Nervous Breakdown from the album, plus four live tracks from Stockholm. Sellout's covered in 'Tron flutes, with strings on Neuropsychopathic Eye and Money Machine, although, sadly, they opt for a two-guitar approach on their coruscating cover of Sabbath's Sweet Leaf. Well, wouldn't you like to hear it smothered in Hammond and Mellotron? Another three years, and Hex concentrates even more on their 'Black Sabbath with more Mellotron' sound, although without the complex song structures (Bats In The Belfry I excepted); saying that, the actual songwriting has improved noticeably. Yet again, Damon Fox goes completely bonkers on the 'Tron, mostly strings, although distinctly 'Strawberry Fields'-style flute parts infiltrate Rock & Roll Contract and Bats In The Belfry I, while the odd bit of choir pops up, pretty much as on Money Machine, to be honest. 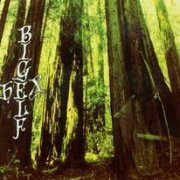 For some reason, Bigelf have broken through in Scandinavia (Hex was even recorded in Sweden) and seem to divide their time between there and the US, so there doesn't seem much chance of seeing them in the good old UK, at least at the moment. Shame. 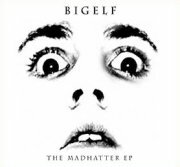 Incidentally, Madhatter, described sardonically by Fox as 'a YouTube hit', was released as an EP, with three more 'Tron tracks added, strings all over Brown-Eyed Girl, Why? 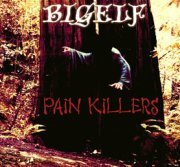 and Bats In The Belfry III, plus flutes and choirs on the last-named, not to mention Psyclone, the flip to the Swedish single release of Pain Killers. 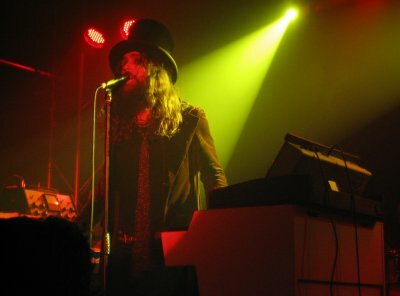 The gestation of Bigelf's fourth album, 2008's Cheat the Gallows, was even longer than for its predecessors. Amazingly, they've got themselves signed to, if not a major, at least a label run by someone with a 'name', Linda Perry (4 Non Blondes, mucho production work), which might even mean that the outside world may notice them. Stranger things have happened... 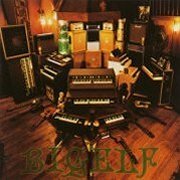 It's another good Bigelf album, basically, although less full-on and more varied than before, perhaps, with several longer, proggier tracks amongst the likes of the single, Money, It's Pure Evil (an expanded version of $ from Hex). Now, before hearing this, I was told 'they're using loads of real strings this time'. To an extent, they have, but there's still plenty of 'Tron for the enthusiast; look, these guys use one on tour... Anyway, Fox plays background strings on Blackball, good old 'Strawberry Fields'-style flutes on Money, It's Pure Evil with more upfront strings, flutes and choirs on Evils Of Rock & Roll. Obvious choirs and strings on No Parachute, occasional strings on Superstar and more of the same on Race With Time and Hydra and although the rest of the album's strings seem to be real, I'm absolutely assured there's at least a little Mellotron on every track. Damon has stated that the band actually split after touring Cheat the Gallows, due to internal and external pressures; he spent the interim playing for Lisa Marie Presley, although he isn't on 2012's Storm & Grace, sadly. 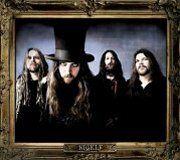 He'd connected with (by now ex-) Dream Theater drummer Mike Portnoy a few years earlier, who called, the conversation going something like this: "I told him that Bigelf was over. He joked that he had to get his fix. I told him the only way he was going to hear some tracks was if he played on the album." 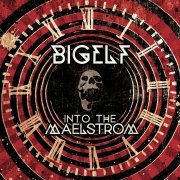 The resulting collection of songs, 2014's Into the Maelstrom, features Portnoy as the only other consistent member (note: track 11, Theater Of Dreams); he hasn't actually joined the band as such, although he's guested on some subsequent live dates. 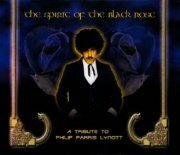 Long-standing Finnish bassist Duffy Snowhill plays on half of the tracks, with various guest guitarists and backing vocalists cropping up here and there, while Fox covers much of the guitar and bass work himself. ...And? 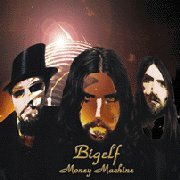 It's a Bigelf album, of course, sounding like (in Damon's words) 'a cross between The Beatles and Black Sabbath', highlights including opener Incredible Time Machine, The Professor & The Madman, the proggy Vertigod, the deranged Control Freak and Edge Of Oblivion, but, despite the album's hour-long running time, there's no dead wood. Mellotron everywhere, of course, with strings on pretty much everything, other use including vibes and choirs on Hypersleep, brass on Alien Frequency, church organ on The Professor & The Madman, flutes and cellos on Mr. Harry McQuhae, pitchbent strings on Control Freak and High and everything on the three-part ITM. Incidentally, the two-disc edition adds twenty-odd minutes of different mixes and demos, two of which (Alien Frequency and Mr. Harry McQuhae) are Mellotron-free upright piano demos. So; loads of Mellotron and good, groove-driven early-'70s sounding stuff. Worth a flutter.